MITZPE RAMON–Today we finished our exploration of the Upper Cretaceous near Mitzpe Ramon, and then met some old friends for a different project near Ar’arat an-Naqab in the northernmost part of the Negev. This gave me the chance to take a picture of my three favorite Israeli geologists. (Yes, actually getting them to turn around for the camera would have been a bit too much stage management on my part!) 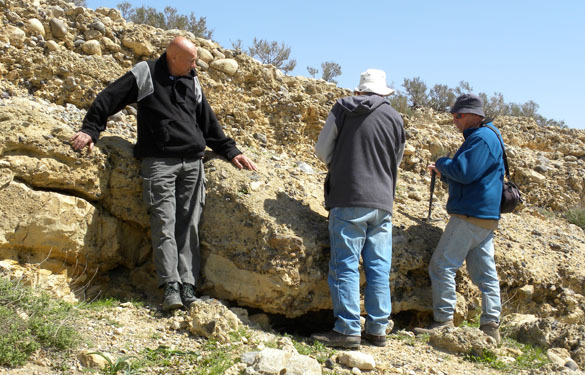 On the left is Shlomo Ashkenazi, a retired geological technician and superb field assistant who still volunteers for the Geological Survey of Israel. In the center is Amihai Sneh, also retired from the survey (retirement doesn’t mean much for geologists!) and a mapping genius, and then Yoav Avni, who you met earlier in these posts. At their knees you see a light brown unit that was the subject of our meeting. It is a dolomite, apparently from the Miocene, that has structures in it that may be trace fossils. They wanted my opinion. Here they are on a bedding plane of the dolomite. 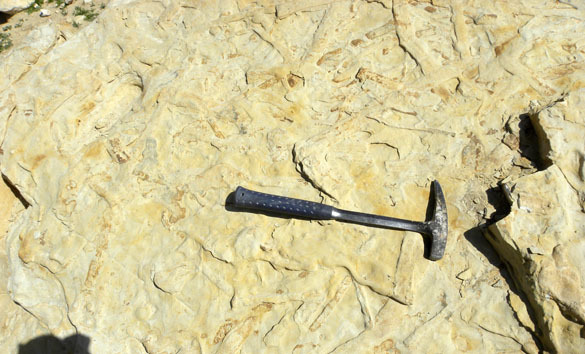 Yes, they are trace fossils. My work here is done. We explored the area around a Bedouin city, one of three in Israel. This is Ar’arat an-Naqab. A “Bedouin city” would have been a contradiction in terms a generation ago. The Bedouin were a nomadic people in this region. The Israeli government set aside land for the settlement of Bedouin, and these modern cities are the result. There is still considerable tension, though, with Bedouin who remain in tents and other structures on what is officially government land. The motivation for them to leave several acres of land they have claimed so that they can live in apartments is, as you can imagine, rather low. We talked to several Bedouin today as we looked for outcrops. Since we were in a government vehicle, there was some suspicion that we were plotting to take their land, but once we explained our geological mission, all was well. Thus ends the 2012 Wooster Geology expedition to Israel. All our goals were met, and we were once again surprised by how many new things we saw and learned. It has been a wonderful adventure! Thank you again to The College of Wooster and donors and granting agencies who have made such trips possible. 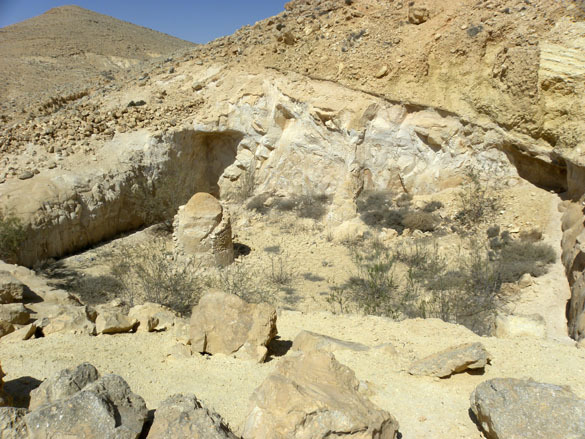 MITZPE RAMON, ISRAEL–We had an earlier post about water management techniques by Iron Age peoples in the northern Negev. Today during our last period of fieldwork on this trip we ran into a complex Nabataean system in a valley a few kilometers north of Mitzpe Ramon. Nabataeans were an Arab people based in Jordan who spread in influence and settlement through this region from roughly the third century BCE to the third century CE. They are most remembered here for their water systems to support their small villages. The infrastructure they built is still used in many places by the Bedouin. Today while exploring more Upper Cretaceous sites, we came across the cistern pictured at the top of this entry. It is a Nabataean structure because it is cut into solid rock (the Iron Age equivalents were mostly in clays) and it had a roof held up by the central pillar and interior walls. There are also steps cut into the rock for climbing in and out. The Nabataeans inherited the earlier Iron Age technology and improved on it by better water retention in the container, and reduced evaporative loss. The cistern we just saw is pictured here from a distance. It is indicated by the tailings of rock debris produced in its construction. On the left hand side you can see a diagonal line of rock indicating part of the water catchment system. There is a similar line on the right, but it is very hard to see. The low rock wall here held in soil for an irrigated field on the left side. The soil has been modified by the original farmers, who built it up with water-holding loess deposits. Some of these fields are still in occasional use by Bedouin who plant wheat in the ancient ground. 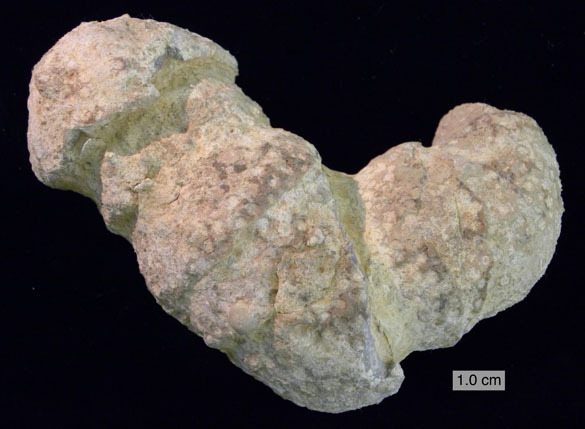 Since Melissa Torma and I recently returned from our expedition to southern Israel (see immediately previous posts), I thought our weekly fossil highlight should be one of our specimens collected from the Middle Jurassic Matmor Formation of Makhtesh Gadol. This is a colonial scleractinian coral, a group that first appeared in the Triassic. It was originally made of aragonite and is now recrystallized to calcite. The exterior is well preserved, but the interior is coarsely crystalline. You can just make out faint outlines of the individual corallites that make up the colony. The distinctive feature of this specimen is that it shows different growth directions. Apparently it was disturbed on the seafloor as it grew, so it periodically had to change its direction to keep growing upwards towards the sunlight. It needed the light because it had photosynthetic symbionts in its tissues. This coral is one of many indications of the shallow paleoenvironment we’ve proposed for the Matmor Formation. It is also encrusted by a variety of sclerobionts, so it is a bit of a community all on its own.